Noel Bisai is a Malawi native born in a small village in the southern rural region of the country. Noel was never formerly taught how to paint, instead around the age of 12yr old he moved from the rural area of Malawi to live with his elder brother, a well known artist to the locals, it was then Noel discovered his passion for the arts. His elder brother took Noel under his wings and Noel felt very fortunate to have his sibling guide him in becoming successful enough to make a living doing art. He took every opportunity to shadow his elder brother being that he was so successful. Every day Noel would practice his making his paintings with the criticism of his brother. Witnessing him brothers success despite the disability inspired Noel to achieve his artist ambitions. In 1996 his brother suddenly passed away, Noel knew after his brother passing that he had to carry his brothers legacy. He now lives in the capital city with his wife and 7 children, selling artwork to tourists. In addition to selling his art, Noel has found his true calling and is now a preacher in Lilongwe. He still does his artwork when he has the time. Noels ambition is to grow his art cliental internationally in order to assist him in expanding his ministry. Peter Mkoweka was born on 22 September 1972 and is now married with three children, a chewa by tribe. He is the third born child in the family of eight children whom are all artists in their own rights. It wasn’t until 2001 that he begun to take art seriously after being inspired by his late brother Ted Mkoweka. Now he is established as an artist and is one of the best batik artist in all of Malawi, known for vibrant colorful batiks very similar to Ted’s style of batiks. He makes most of his sells in the local streets to tourist and visitors alike. When Peter isn’t painting nor holding exhibitions he farms as his form of trade to make a living. Since Malawi tourism has been on the decline over the last few years he has had to rely on his farming trade in order to support his family. His ambition is to become well known internationally and become the great artist his late brother Ted inspired him to become. Ellis Tayamika Singano, born in a family of 6 in Blantyre, Malawi, now he resides in Lilongwe. He started painting batik at the age of 10, learned batik from his father, who was also an artist. As a youth his ambition was always to be a scientist not an artist. Unfortunately after his father suddenly become very ill Ellis helped completed some of his unfinished paintings. After his fathers passing many of his fathers clients began to take notice in the artwork Ellis produced and so began his art career. 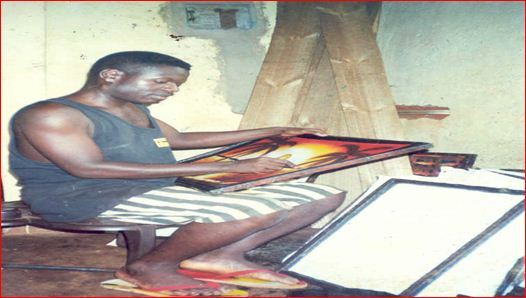 At age 18, with they growing demand of his new art, he decided to fully focus on his art in order to help his mother now provide for the family. His dreams of becoming a scientist were now buried. Ellis began reading about artists like Pablo Picasso, Claude Monet and Henri Matisse – they inspired him with their great pieces of art. Besides his father Ellis’s major influence in painting batiks was derived from mouth painter-Chrisfold Chayera. Chrisfold mentored Ellis in developing his own style and separating himself from other Malawian artist. Apart from painting batik, Ellis interests lye in doing the unique form of soil art-an art in which he uses different colours soils ,ashes and flour. He has also been involved with a number of workshops in Malawi, helping other young artists develop their craft. Ellis has been fortunate with the success of his artwork and has been featured in a numerous art exhibitions throughout Malawi. after a suffering from malaria attack that later became polio. 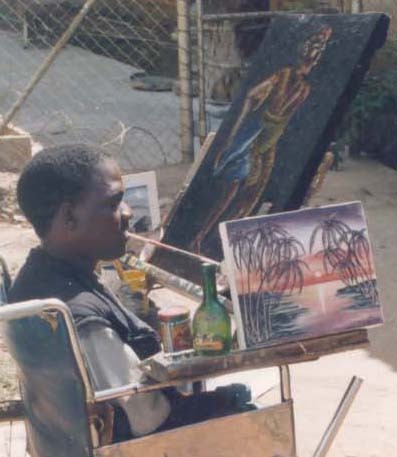 Because his limbs are dead, he paints using his mouth rather than his hands. Chayera says he was born a talented artist and was the best art pupil at school. But after Malaria, he could no longer draw due to paralysis. Little by little, however, he learned to paint using his mouth. Today Chrisfold Chayera is happily married, has children and mentors other artists, both physical and able. In addition, Chrisfold works as an advocate for others with disabilities in Malawi and serves as a member of VSA (Very Special Arts) of Malawi, organization based out of Washington DC that assists people with disabilities pursue their artistic passions. 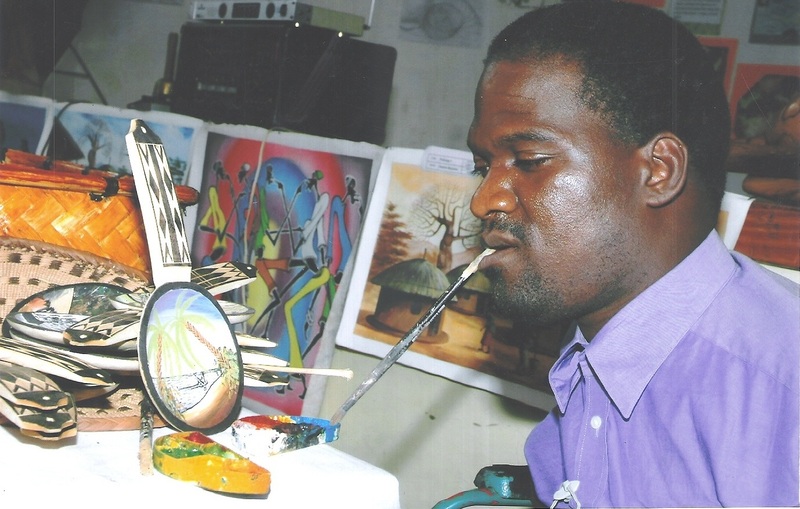 Chayera believes he is blessed to have overcome such a significant disability and he continues to purse his other passion he loves most in his little spare time ―paint. 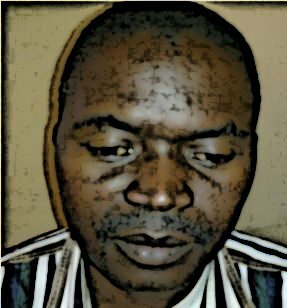 Peter Chikondi born and resides in Malawi, is married and started doing art at an early age. He developed an interest towards drawing pictures of things that interested him. He remembers getting a lot of joy in drawing people and animals in his village. Peter was not able to proceed with education beyond primary level of education because his parents were too poor to afford school fees for him to continue to secondary education. He therefore found himself with lots of time to concentrate on perfecting his art. He began to get more serious on painting by using different medians including painting watercolors, arylic , oil among others. It wasn’t till 1989 that he met Mussa Chiwaula the prominent international batik artist whom he asked to be his understudy on the art of batik making. He worked with him for a number of years and was taught he techniques of batiks. He introduced him to the concept of abstract art and after a very fruitful stint with him, he went solo and he held ever exhibition which were successful. From this success he became encouraged, shortly after he joined the Art Group, an art club that was formed to promote artistic talent. He sold his work to many admirers which included people who resided in neighboring countries including South Africa. Like his mentor Mussa Chiwaula, he loves to draw things that interest him like people in the villages doing day to day activities and also wildlife. His ambition is to participate in many international exhibitions so that he shares his perceptions. Ted Samuel Mkoweka (born 1965 – 2005) Malawi, Africa was married with a wife named Judith and a daughter by the name Mercy. On March 15, 2005 sadly Ted Samuel was a victim of severe malaria that he fought for weeks before suddenly passing away at the young age of 40. His art education background dates back from 1988 when he received his Junior Certificate of Education. From 1988 until 1990 he attended Dedza secondary school in order to learn more about art. After completing his education in 1992 he met a man from Zaire who taught him special type of art called ‘Batiks’. From 1994 he became self employed painting Batiks while earning money and supporting his family. Ted Samuel had a bright promising feature because of his rare artist talent. When it came to batiks Ted was well know for his bright and colorful style he enjoyed using on his batiks. He made a comfortable living making batiks and he helped his two brothers start painting batiks for a trade as well. And now they also are self-employed. Before he past away he was able teach his wife Judith the same trade. Ted Samuel’s goal was to open a Gallery and promote upcoming artists to enable themselves sell their artwork. Mussa Chiwuala is an internationally acclaimed artist who has held exhibitions all over the world with his unique style of batik artwork. He was born as a paraplegic and learned painting batik artwork despite his disability He started painting during his youth when he used do some natural drawings in school. At times his teachers used to ask him to draw posters for them to use for class lessons. Never did he imagine that he would turn this talent into something profitable and something that would give him the opportunity to travel in various countries to exhibit. The turning point came when he was refused entry to the local University because of the fact that he had a disability and he used a wheel chair. Frustrated, he tried to look for a job but all attempts were in vain. Then he met a man severely disabled by polio who used his mouth to paint and he introduced him to the medium of batik. After sometime under his tutelage, he held his first art exhibition in Malawi in 1979, which was a huge success. He later held other exhibitions in Vancouver, Canada; Sydney, Australia; Taipei, China; Cape Town, South Africa and Gaberone, Botswana among others. His art consists of capturing different human activities that happen around him as a youth in the nearby village but mostly he love themes that relate to village women activities. His belief is that art can be used to preserve different cultural values that are to face extinction. Currently Mussa’s passion for the artist has taken a backseat to a much greater cause, becoming a major activist in the disability community in Africa. He is now Botswana and is the head of SAFOD (Southern Africa Federation Of the Disabled) in Botswana. SAFOD is a leading Southern African disability-focused network engaged in coordination of activities of organisations of disabled persons in the Southern region that includes 10 countries (Malawi, Botswana, Zambia, South Africa. among others). Previously Mussa also served is an executive director of a disability organization that fights for the rights of persons with disabilities called FEDOM(Federation of Disability Organizations in Malawi) as well as being the Director of Very Special Arts Malawi that is affiliated to VSA International whose headquarters is in Washington DC. VSA International seeks to promote artistic expression among persons with disabilities and thus help build an Inclusive society. Although most people now are only aware of Mussa the activist not the artist, he feels privileged to have used art as a vehicle that opened doors to serve a much greater calling.